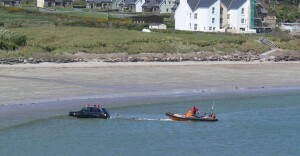 A Community Inshore Rescue Service operating in Ballinskelligs Bay and the surrounding coastal area. The organisation currently uses a 5metre inflatable (ex-RNLI D-class), and a new Tmetre RIB which was. delivered in July 2008. The boats are based at Reen Pier Ballinskelligs and when not in use, are stored in a new boat house which was completed in October 2008. Since the volunteer crew was first formed to operate the service more than 2 years ago, the number of active crew members has varied in the range 16 to 24, partly influenced by seasonal factors relating to occupations and scope for water-based training. Training covers competencies such as Basic First Aid, VHF Radio, Powerboat handling, Navigation, and practical seamanship skills. It is the objective of the organisation to be approved as a Designated Facility by the Irish Coast Guard which signifies that a service is competent to be called out by the Marine Rescue Co-ordination Services. We plan to apply during 2009 for assessment by the Irish Coast Guard and in the meantime, will be focusing on our training to bring the skills and experience of the crew up to the required standard. Is le cabhair 6n Roinn Gnothai Pobail, Tuaithe agus Gaeltachta, chomh maith le airgead a bailiodh go h6itifil agus ar fud na tire, atina h6iseanna seo 6 gcur ar fdil. Meastar go bhfuil sd trdthriil a leith6id de seirbhis a bhunri ag an am seo, nuair atii acmhainnf mara 6 fhorbairt 6 thaobh caitheamh aimsire, sp6rt-iascaireacht, agus turas6ireachta . For enquiries, or if you would like to become involved, please contact 087-6881118.